“I don’t exist,” says Sandra (Marion Cotillard) to her husband, Manu (Fabrizio Rongione). “I’m nothing. Nothing at all.” She’s been off work on sick leave, and has just learnt that the boss at the small solar-panel factory where she works has made a proposal to her 16 colleagues. Times are tight, the boss has said to them. You can take a €1000 bonus, and we’ll make do with 16 workers. Or Sandra comes back from sick leave, and you can forgo the bonus. A vote is taken. A majority of the workers want the bonus. It’s a Friday afternoon when Sandra learns the news. Desperate, she gets the reluctant boss to agree to a new vote on Monday morning, and spends the weekend seeking out each of her co-workers, in the hope of changing their minds. Belgian brothers Jean-Pierre and Luc Dardenne started their film-making lives, in the late 1970s and early ’80s, as documentarians. In their transition to feature films they retained an elegant sense of observational stillness. Two Days, One Night (in national release 6 November) is their ninth feature. As an artistically coherent body of work, the brothers’ films achieve the effect of seeming unruffled but intense, serene but vibrant. There’s a transparency to them – no special effects, no score, no tricks, no flashbacks – that lends them an emotional immediacy. In The Child (2005), the feckless Bruno (Jérémie Renier), a petty criminal barely out of his teens, hits upon the brilliant idea of selling his teenage girlfriend’s newborn baby on the black market. The film’s quiet, surprising power lies not so much in the shock of the premise as in the way it does not strive to cast moral judgement. In the moving Rosetta (1999), Émilie Dequenne is a survivor, though sometimes only just, in constant fierce opposition to everything the world throws at her, including but not limited to her hopelessly alcoholic mother. In the mysteriously lovely The Son (2002), about grace, compassion, forgiveness and what the Dardennes called “the moral imagination”, Olivier (Olivier Gourmet), a taciturn carpentry teacher at a vocational school, fixates, with increasing obsessiveness, on new student Francis (Morgan Marinne), who is fresh out of reform school. For much of the film’s running time we feel, disconcertedly, that we might just be watching a thriller. Its small miracle is the way in which it becomes a meditation on loss and a poem about redemption. Two Days, One Night is less austere than that radiant film, but no less simple. Sandra has 16 tasks ahead of her, and will move through them methodically. In little more than 48 hours her moods will swing to extremes. She’ll meet kindness, self-interest, aggression. Jean-Pierre Dardenne has spoken of “the obsession with performance and violent competition between workers” that is the face of the new workplace, not just in the bland, working-class milieu that the brothers depict, but around the world. The film tracks the human fallout from a single instance of belt-tightening in a small, obscure factory in Belgium, but its themes feel universal. To make matters worse, Sandra learns that the floor manager, Jean-Marc (Olivier Gourmet, a Dardenne favourite), has been phoning the same co-workers she is trying to visit, and spreading misinformation. “He thinks you can’t work so well after being sick,” says Hicham (Hicham Slaoui). We gradually learn that Sandra’s sick leave was due to depression. As the weekend progresses, she starts taking Xanax; these moments play as if this is a kind of relapse, or a sudden ill-advised increase in consumption. The prognosis is grim. Timur (Timur Magomedgadzhiev), a recent immigrant somewhere near the bottom of the factory’s pecking order, remembers a kindness she did for him – saving his job, in effect – and tells her he’ll change his vote. Sandra is assured of three votes, then four. She feels the momentum shifting. It’s a nice touch that the Dardennes have made the factory a solar-panel manufacturer. It’s green and groovy and politically correct, but the brothers want us to know that these employees are still very much the 21st-century working class. “I can’t stop crying,” says Sandra to Manu, when things are looking bleak. “I’m losing my voice.” Metaphorically, the film posits that the new economic reality – the worldwide push to radical de-unionisation, the constant threat of job loss – is at its core a form of voicelessness. But Two Days, One Night – a staunchly working-class film and an old-school realist drama – is not about a woman finding her voice. Rather, it’s a gently cumulative investigation of the notion of dignity. Will Sandra lose it in the effort to gain it? The Xanax thread, especially in its resolution, ultimately feels a little laboured, and scattered moments play out as corny and oversimplified. The film is completely episodic – each encounter a discrete unit, until everyone comes together in the workplace on Monday morning. There will be those for whom the film’s unfolding is banal, because it is predictable. (One imagines, too, that the screenplay could have felt very flat on the page.) In fact, there’s something gently entrancing at work here. The power of the Dardennes’ film-making does not lie in bombast, and while Two Days, One Night isn’t a high-octane affair, it does feel populated by actual humans. As a vision of a world in which deliberately instilled anxiety and fear rather than basic job security drive workplace loyalty, Two Days, One Night brings to mind that 19th-century naval saying: “Everyone gets kicked, and the cabin boy kicks the cat.” It’s an oddly apt description, too, of the pecking order in the elite New York music academy that is the setting of the young American director Damien Chazelle’s terrific, dynamic, viscerally gripping feature Whiplash (in national release). 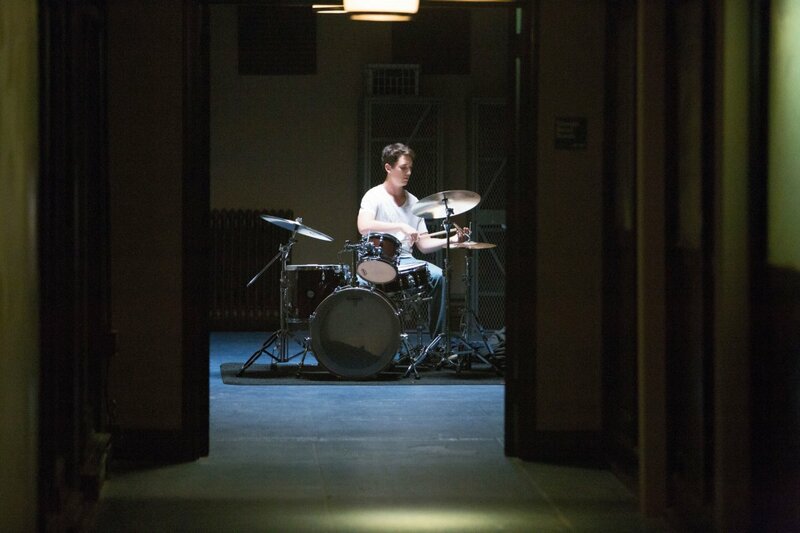 Miles Teller is Andrew Neiman, a talented jazz drummer with dreams of greatness. JK Simmons is Terence Fletcher, the teacher who leads the school’s top jazz ensemble. Neiman is a young pup, full of heart, ready to work incessantly – drumming in basement rooms long into the night – in his quest for glory; his hero is the great Buddy Rich. Fletcher, in his tight black T-shirts, his head shaved, is like a cobra. He’s all coiled muscle and venom, and seems to know only two postures: striking, or about to strike. There’s something Jesuitical and fanatical about Fletcher, and he clearly comes from the “spare the rod and spoil the child” school of pedagogy. “There are no two words in the English language more harmful than ‘good job’,” he says. He’s sadistic, and toys with Neiman. We think we’ve seen this sort of thing before: marine sergeants, basketball coaches, the brutal father–son relationship in Shine (1996). Rocky (1976), even. The scrappy kid who’ll harbour and nurture his secret dream and fight on through adversity. In becoming, quite overtly, a film about the relationship – that is, the power imbalances – between an abusive mentor and his protégé, Whiplash never drops those basic tropes. But it largely transcends them, because it is a kinetic marvel of tightly orchestrated scripting, a battle played out between protagonist and antagonist as a series of exhilarating surges and countersurges. We forgive it if Chazelle has pushed some moments to extremes, including Fletcher’s drill-sergeant nastiness, because we want so badly for the belittled, tortured Neiman to right the injustices that pile upon him. In Whiplash, the notion of “finding one’s beat” does not just operate abstractly as theme and metaphor, but also becomes the heart and soul of a dazzling revenge narrative, in which the brilliantly edited performance sequences show music as a kind of martial art.